Chinese regional cuisines are the different cuisines found in different provinces and prefectures of China as well as from larger Chinese communities overseas. A number of different styles contribute to Chinese cuisine but perhaps the best known and most influential are Cantonese cuisine, Shandong cuisine, Jiangsu cuisine (specifically Huaiyang cuisine) and Szechuan cuisine. These styles are distinctive from one another due to factors such as availability of resources, climate, geography, history, cooking techniques and lifestyle. One style may favour the use of lots of garlic and shallots over lots of chilli and spices, while another may favour preparing seafood over other meats and fowl. Jiangsu cuisine favours cooking techniques such as braising and stewing, while Sichuan cuisine employs baking, just to name a few. Hairy crab is a highly sought after local delicacy in Shanghai, as it can be found in lakes within the region. Peking duck and dim-sum are other popular dishes well known outside of China. Based on the raw materials and ingredients used, the method of preparation and cultural differences, a variety of foods with different flavors and textures are prepared in different regions of the country. Many traditional regional cuisines rely on basic methods of preservation such as drying, salting, pickling and fermentation. Cantonese cuisine (Chinese: 粤菜; pinyin: yuècài), Dim sum, a Cantonese term for small hearty dishes. These bite-sized portions are prepared using traditional cooking methods such as frying, steaming, stewing and baking. It is designed so that one person may taste a variety of different dishes. Some of these may include rice rolls, lotus leaf rice, turnip cakes, buns, jiaozi-style dumplings, stir-fried green vegetables, congee porridge, soups, etc. 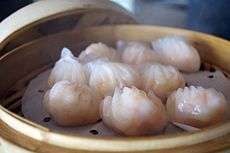 The Cantonese style of dining, yum cha, combines the variety of dim sum dishes with the drinking of tea. Yum cha literally means "drink tea". Sichuan cuisine (Chinese: 川菜; pinyin: chuāncài; spelled Szechuan or Szechwan in the once-common postal romanization) is a style of Chinese cuisine originating from the Sichuan Province of southwestern China, famed for bold flavors, particularly the pungency and spiciness resulting from liberal use of garlic and chili peppers, as well as the unique flavor of the Sichuan peppercorn (花椒; huājiāo) and Facing heaven pepper (朝天椒; cháotiān jiāo). Peanuts, sesame paste and ginger are also prominent ingredients in this style. Anhui cuisine (徽菜; huīcài or 徽州菜; huīzhōu cài) is derived from the native cooking styles of the Huangshan Mountains region in China and is similar to Jiangsu cuisine, but with less emphasis on seafood and more on a wide variety of local herbs and vegetables. Anhui province is particularly endowed with fresh bamboo and mushroom crops. Shandong Cuisine (鲁菜; lǔcài) is commonly and simply known as Lu cuisine. With a long history, Shandong Cuisine once formed an important part of the imperial cuisine and was widely promoted in North China. Lu cuisine dishes are known for their fresh, salty, crisp, and tender features. Lu cuisine chefs devote particular care to the seasoning of both clear broth and creamy soup. It was favored by the imperial family in the Ming and Qing dynasty. Shandong Cuisine features a variety of cooking techniques and seafood ingredients. The typical dishes on local menu are braised abalone, braised trepang, sweet and sour carp, Jiuzhuan Dachang and Dezhou Chicken. Fujian cuisine (闽菜; mǐncài) is influenced by Fujian's coastal position and mountainous terrain. Woodland delicacies such as edible mushrooms and bamboo shoots are also utilized. Slicing techniques are valued in the cuisine and utilized to enhance the flavor, aroma and texture of seafood and other foods. Fujian cuisine is often served in a broth or soup, with cooking techniques including braising, stewing, steaming and boiling. Jiangsu cuisine (苏菜; sūcài) is one of the major components of Chinese cuisine, which consists of the styles of Yangzhou, Nanjing, Suzhou and Zhenjiang dishes. It is very famous all over the world for its distinctive style and taste. It is especially popular in the lower reach of the Yangtze River. Typical courses of Jiangsu cuisine are Jinling salted dried duck (Nanjing's most famous dish), crystal meat (pork heels in a bright, brown sauce), clear crab shell meatballs (pork meatballs in crab shell powder, fatty, yet fresh), Yangzhou steamed Jerky strips (dried tofu, chicken, ham and pea leaves), triple combo duck, dried duck, Farewell My Concubine (soft-shelled turtle stewed with many other ingredients such as chicken, mushrooms and wine), and sweet and sour mandarin fish (Suzhou cuisine). Zhejiang cuisine (浙菜; Zhècài or 浙江菜; zhèjiāngcài) derives from the native cooking styles of the Zhejiang region. The dishes are not greasy, having instead a fresh, soft flavor with a mellow fragrance. Many other regions and ethnic groups with unique dishes and styles are represented in China, including Hakka, Macau, Hainan, Taiwan, the Northeast, and many more. 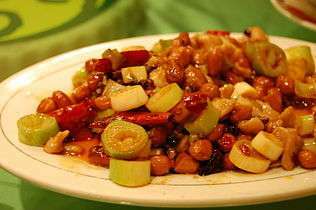 The cuisine of Xinjiang reflects the region's many ethnic groups, and refers particularly to Uyghur cuisine. Signature ingredients include roasted mutton, kebabs, roasted fish and rice. Because of the distinctive Muslim population, the food is predominantly halal. Mongolian hotpot is very famous in China, and popular with the Han ethnic group too. It has many franchises. Tibetan cuisine is traditionally served with bamboo chopsticks, in contrast to other Himalayan cuisines, which are eaten by hand. Small soup bowls are used, and the wealthier Tibetans ate from bowls of gold and silver. Yunnan only began to come under significant Chinese influence some 1000 years after Sichuan was annexed. As the most geographically, ethnically and culturally diverse province in modern China, it naturally features a wide variety of cuisine. ↑ "Regions of Chinese food-styles/flavors of cooking." University of Kansas, Kansas Asia Scholars. Accessed June 2011. ↑ "Eight Cuisines of China - Shandong & Guangdong." Travel China Guide. Accessed June 2011. ↑ "China's Culinary Diversity in One Map"
↑ J. Li & Y. Hsieh. Traditional Chinese Food Technology and Cuisine. Asia Pacific Journal of Clinical Nutrition. 1 2 3 4 "Fujian Cuisine. Beautyfujian.com. Accessed June 2011. ↑ "Hunan Cuisine." China.org, Chinese Imperial Cuisines. Accessed June 2011.